Citation: Bhartiya D. Intricacies of Pluripotency. J Stem Cells Regen Med. 2015; 11(1):2-6. Pluripotent stem cells have the potential to differentiate into 200 odd cell types present in adult body. Pluripotent stem cells available for regenerative medicine include embryonic stem (ES) cells, induced pluripotent stem (iPS) cells and very small ES-like stem (VSELs) cells. Nuclear OCT-4 is one of the crucial factors that dictate pluripotent state. Compared to ES/iPS cells grown in Petri dish, VSELs exist in adult body organs and results are emerging to suggest that they may have better potential to regenerate adult organs. This is because of their distinct epigenetic status as they are closer to the primordial germ cells from the epiblast-stage embryo compared to inner cell mass from which ES cells are obtained in vitro. We need to make special efforts to study them as they are very small in size and tend to get lost during processing. VSELs exist in adult organs, get mobilized in response to stress, undergo asymmetric cell divisions to give rise to tissue specific progenitors which further differentiate into various cell types and are possibly better candidates for regenerative medicine because they have no associated risk of tumor formation or immunological rejection. They are possibly also the ‘embryonic remnants’ in adult organs responsible for initiating cancer. Thus, rather than not accepting VSELs because they neither form teratoma nor divide in vitro like ES cells, it is time that scientific community should think of revising the definition of the term ‘pluripotency’. For a stem cell to be pluripotent, it must express nuclear Octamer binding protein (OCT-4). If the embryonic stem (ES) cells lose OCT-4 expression during culture, it is concluded that they must have differentiated and a new vial of frozen ES cells has to be revived for various experiments. Being a transcription factor, OCT-4 acts by binding to DNA and regulates the expression of several genes involved in embryonic development and also ES cells differentiation. Besides OCT-4, other pluripotent markers expressed by ES cells include SSEA-4, TRA-1-80, TRA-1-60, SOX-2, NANOG, REX. In fact OCT-4, SOX-2 and NANOG are transcription factors together termed as the “Triumvirate of Pluripotency” [1,2] and co-occupy promoters of at least 353 genes in ES cells. OCT-4 belongs to Octamer class of transcription factors that recognize 8 base pairs DNA site with the consensus ATGCAAAT. Along with PIT and UNC protein, OCT defines POU class of transcription factors that interacts with DNA. OCT-4 is crucial for pluripotency & self-renewal and silencing OCT-4 results in differentiation of ES cells . The work that was awarded Nobel Prize for Medicine in 2012 showed that OCT-4 is also crucial to re-establish pluripotency during reprogramming of adult somatic cells to embryonic state while making iPS stem cells . During the early embryonic development, cells comprising inner cell mass of blastocyst are pluripotent, express nuclear OCT-4 and are used as starting cells to establish ES cell cultures in vitro. Blastocyst develops into an epiblast stage embryo where a small number of cells termed primordial germ cells (PGCs) retain pluripotency and give rise to germ cells whereas majority of cells lose the pluripotent state and differentiate into somatic organs in the body. OCT-4 expression is thus expected to get restricted to the PGCs and somatic organs should ideally not express OCT-4. PGCs migrate along the dorsal mesentery and reach the gonadal ridge where they give rise to gonocytes. However, seminal contribution from Prof. Ratajczak’s group from University of Louisville, USA has shown that PGCs while migrating to the gonads also migrate to all developing somatic organs and survive throughout life in small numbers and are termed as very small embryonic-like stem cells (VSELs) [5,6]. Compared to ES/iPS cells which are grown and exist in cultures, VSELs are true pluripotent stem cells that exist in body organs. They are mobilized whenever functioning of any of the body organ is compromised [7-11] in an attempt to facilitate regeneration but normally remain quiescent and act as a backup pool of stem cells, undergo asymmetric cell division to self-renew and give rise to tissue specific progenitors which divide rapidly and differentiate into tissue specific cell types. This is in agreement with recent publications describing dormant and restless stem cells in bone marrow, hair follicle, gut epithelium etc. [12,13]. Several groups have reported on the differentiation potential of VSELs into various lineages [14-20]. Interestingly, VSELs are considered to be the ‘embryonic remnants in adult tissue’ suggested by Rudolf Virchow, Julius Cohnheim, and John Beard in 19th and 20th centuries possibly responsible for various cancers in adult life . While studying OCT-4 expression in various cell types, we need to be aware that it exists as two major alternatively spliced isoforms OCT-4A and OCT-4B [22,23]. Of these OCT-4A has nuclear expression and is responsible for pluripotent state of a cells and once the cells initiates differentiation, nuclear OCT-4 is as longer required, shifts to the cytoplasm and eventually gets degraded as cell differentiates further. We have observed that immediate descendants or the tissue specific progenitors which arise from VSELs can be identified by presence of cytoplasmic OCT-4 which eventually disappears as cells get further differentiated. This interesting OCT-4 immuno-staining pattern was first reported while studying human testicular tissue. Cells with nuclear OCT-4 in adult human testicular cell smears (Figure 1) are few in number whereas cells with cytoplasmic OCT-4 divide rapidly, undergo clonal expansion and then differentiate further to give rise to tissue specific cell types . Similarly, we have reported presence of VSELs in adult mammalian ovarian surface epithelium. These stem cells are smaller than RBCs, express nuclear OCT-4 and cell surface SSEA-4 whereas the immediate progenitors express cytoplasmic OCT-4 . Occasionally, we observe the presence of germ cell nests with cytoplasmic OCT-4 which actually represents clonal expansion of progenitors and later breakdown and undergo further differentiation and meiosis into oocytes [26,27]. We have proposed that VSELs may be implicated in ovarian cancers [28,29] and also pancreatic cancers . Then why these stem cells (VSELs) are not getting accepted by various investigators for regenerative medicine? The main reason is their very small size because of which they have eluded the scientific community at large, easily lost during processing  and controversy over their very existence erupted in 2013 [32,33]. But this appears to be more of a technical issue and was addressed by Ratajczak’s group . Although presence of VSELs was denied by Weissman's group in 2013 , they did discuss a ‘mystery population’ of LIN-/SCA-1+ quiescent cells in mouse bone marrow in 1998 . However, it was Ratajczak’s group which described and characterized these cells in details for the first time in 2006  and at present more than 100 publications exist on PubMed describing various aspects of VSELs biology. This brings us to the intricacies of pluripotency. Let us now examine and compare ES cells with VSELs (Figure 2). Both are pluripotent and have the ability to differentiate into three germ layers. However, VSELs neither form teratoma nor integrate in a developing embryo to form a chimera. More importantly, VSELs cannot be expanded as cell lines implying that they remain quiescent in vitro. They do not proliferate in culture like ES cells. Due to these differences, scientific community does not accept VSELs as pluripotent stem cells like ES cells and this needs to be urgently discussed in various forums. Formation of teratoma is considered as a gold standard test to evaluate pluripotency of ES cells. We need to remember that VSELs are pluripotent stem cells existing in adult body organs and nature has provided them inherent mechanisms to remain quiescent [38,39] otherwise adult body organs will have tumors all the time. The other concern is that if they exist in very few numbers – how they can be used to regenerate adult organs? The response to this is that stem cell biologists need to think beyond injecting stem cells for regeneration – strategies need to be evolved which will allow manipulation of endogenous VSELs to our advantage. Compared to ES cells, which have associated issues of immune-rejection and teratoma formation, VSELs can be isolated from autologous source and do not form teratoma. Once these properties of VSELs being better compared to ES cells are understood and appreciated – the need for technologies like iPS cells or therapeutic cloning (SCNT) for obtaining patient specific stem cells which will not face immune rejection during cell therapy will become redundant. Data has now emerged in our lab that VSELs have better differentiation ability compared to ES/iPS cells. Firstly we have shown that VSELs readily differentiate into gametes [17,18] whereas obtaining synthetic gametes from ES/iPS cells still remains a distant dream . Secondly in the field of pancreas biology, ES/iPS cells are falling short as they tend to give rise to their fetal counterparts [41,42] compared to VSELs which regenerate both beta and islet cells in adult mouse pancreas after partial pancreatectomy . It is the distinct epigenetic state of VSELs which gives them better ability to differentiate compared to ES/iPS cells. VSELs are the PGCs and thus have undergone novel imprint erasure on paternally imprinted DMRs (H19-Igf2, RasGRF1). It appears difficult to obtain this distinct epigenetic state in vitro starting with ES cells and attempts to convert ES cells into PGCs have not been successful yet  although attempts are ongoing since mES cells were reported more than 30 years ago [44,45] or hES cells reported more than 15 years ago  and even using the Nobel Prize winning iPS cells . Figure 1: Immunolocalization of OCT-4 in adult human testicular tissue smear (A) and sections (B-D) collected from a patient undergoing orchidectomy as part of management of prostate cancer (results published earlier, Bhartiya et al, 2010). As evident, two distinct populations of spherical cells with nuclear and cytoplasmic OCT-4 were observed in the testicular cells smear (A). Both the cell types with nuclear OCT-4 (VSEL) and with cytoplasmic OCT-4 (spermatogonial stem cells, SSCs) were also detected in a testicular section (B). SSCs with cytoplasmic OCT-4 undergo clonal expansion as evident by the presence of cytoplasmic connectivity amongst them which appear as a chain in the sections (C&D). Magnification A&D 40X and B&C 20X. It becomes prudent, at this juncture, to contemplate how a pluripotent stem cell with open euchromatin becomes committed and initiates differentiation. Majority of the chromatin gets inactivated and only specific genes responsible for the fate to which the stem cell becomes committed remain active and drive differentiation into that specific lineage. Imagine that it is the same VSEL which in the testis gives rise to spermatogonial stem cells (SSCs) and in ovary give rise to ovary germ stem cells which in turn differentiate into sperm and oocytes respectively. Similarly VSELs in pancreas give rise to progenitors which co-express OCT-4 and PDX-1  and further differentiate into pancreatic lineage. This formation of distinct progenitors is dictated by the niche (microenvironment) where the VSEL is localized. Inducing similar epigenetic changes in vitro in ES/iPS cells has proved to be almost impossible and a major underlying road block before translation. In 1998, pluripotent stem cells were reported to be derived from inner cell mass (ES cells) by Thomson’s group and from embryonic primordial germ cells (EG cells) by Gearhart’s group . Stem cells derived by Gearhart’s group failed to make a dent as they did not show good expansion potential in vitro. We believe VSELs are similar to EG cells and in the long run will prove to be the perfect candidates for regenerative medicine. It was recently suggested in Focus Issue on Regenerative Medicine in Nature Medicine to better understand stem cell biology and their regulation by the niche before rushing to the clinics . This is so very true. Let us first decide which are the perfect stem cell candidates for regenerative medicine and re-define the term ‘pluripotency’. Inability of VSELs to form teratoma or integrate in developing embryo does not lessen their regenerative ability. 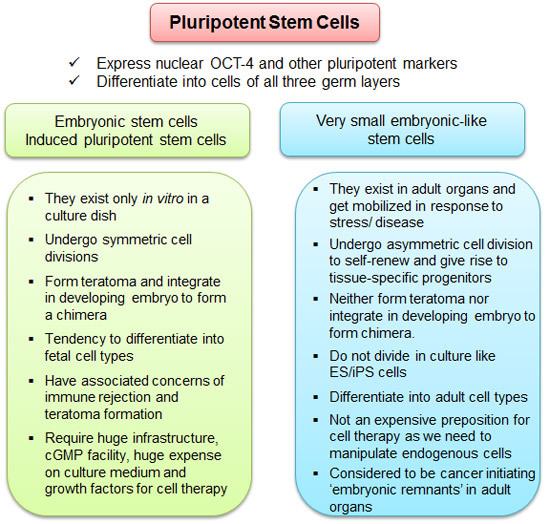 Figure 2 – Schematic diagram of various pluripotent stem cells available for regenerative medicine. As evident VSELs are pluripotent stem cells present in the adult body organs and are crucial for normal functioning compared to ES/iPS cells which exist only in a culture dish. All students and project staff of SCB Department, NIRRH, because of whose hard work- we have arrived at this understanding. NIRRH Manuscript No. IR/239/03-2015. van den Berg DL, Snoek T, Mullin NP, Yates A, Bezstarosti K, Demmers J, Chambers I, Poot RA. An Oct4-centered protein interaction network in embryonic stem cells. Cell Stem Cell 2010;6(4):369-81. Schoorlemmer J, Jonk L, Sanbing S, van Puijenbroek A, Feijen A, Kruijer W. Regulation of Oct-4 gene expression during differentiation of EC cells. Mol Biol Rep. 1995;21(3):129-40. Takahashi K, Yamanaka S. Induction of pluripotent stem cells from mouse embryonic and adult fibroblast cultures by defined factors. Cell. 2006; 126(4):663-76. Ratajczak MZ, Marycz K, Poniewierska-Baran A, Fiedorowicz K, Zbucka-Kretowska M, Moniuszko M. Very small embryonic-like stem cells as a novel developmental concept and the hierarchy of the stem cell compartment. Adv Med Sci. 2014 ;59(2):273-80. Ratajczak MZ. A novel view of the adult bone marrow stem cell hierarchy and stem cell trafficking. Leukemia. 2014, doi: 10.1038/leu.2014.346. Paczkowska E, Kucia M, Koziarska D, et al. Clinical evidence that very small embryonic-like stem cells are mobilized into peripheral blood in patients after stroke. Stroke. 2009; 40(4):1237-1244. Drukała J, Paczkowska E, Kucia M, et al. Stem cells, including a population of very small embryonic-like stem cells, are mobilized into peripheral blood in patients after skin burn injury. Stem Cell Rev. 2012; 8(1):184-194. Marlicz W, Zuba-Surma E, Kucia M, Blogowski W, Starzynska T, Ratajczak MZ. Various types of stem cells, including a population of very small embryonic-like stem cells, are mobilized into peripheral blood in patients with Crohn's disease. Inflamm Bowel Dis. 2012; 18(9):1711-1722. Starzyńska T, Dąbkowski K, Błogowski W, et al. An intensified systemic trafficking of bone marrow-derived stem/progenitor cells in patients with pancreatic cancer. J Cell Mol Med. 2013; 17(6):792-799. Li L, Clevers H. Coexistence of quiescent and active adult stem cells in mammals. Science. 2010; 327:542-545. De Rosa L, De Luca M. Cell biology: Dormant and restless skin stem cells. Nature. 2012; 489:215-217. Bhartiya D, Hinduja I, Patel H, Bhilawadikar R. Making gametes from pluripotent stem cells--a promising role for very small embryonic-like stem cells. Reprod Biol Endocrinol. 2014; 12:114. doi: 10.1186/1477-7827-12-114. Anand S, Bhartiya D, Sriraman K, Patel H, Manjramkar DD. Very small embryonic-like stem cells survive and restore spermatogenesis after busulphan treatment in mouse testis. 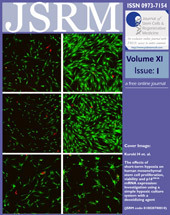 J Stem Cell Res Ther (2014); 4:216. Ratajczak MZ, Shin DM, Liu R, et al. Epiblast/germ line hypothesis of cancer development revisited: lesson from the presence of Oct-4+ cells in adult tissues. Stem Cell Rev. 2010; 6(2):307-316. Wang X, Dai J. Concise review: isoforms of OCT4 contribute to the confusing diversity in stem cell biology. Stem Cells. 2010; 28(5):885-893. Liedtke S, Enczmann J, Waclawczyk S, Wernet P, Kögler G. Oct4 and its pseudogenes confuse stem cell research. Cell Stem Cell. 2007; 1(4):364-366. Bhartiya D, Kasiviswanathan S, Unni SK, Pethe P, Dhabalia JV, Patwardhan S, Tongaonkar HB. Newer insights into premeiotic development of germ cells in adult human testis usingOct-4 as a stem cell marker. J Histochem Cytochem. 2010 Dec;58(12):1093-106. Parte S, Bhartiya D, Telang J, Daithankar V, Salvi V, Zaveri K, Hinduja I. Detection, characterization, and spontaneous differentiation in vitro of very small embryonic-like putative stem cells in adult mammalian ovary. Stem Cells Dev. 2011;20(8):1451-64. Bhartiya D, Sriraman K, Parte S, Patel H. Ovarian stem cells: absence of evidence is not evidence of absence. J Ovarian Res. 2013;6(1):65. Parte S, Bhartiya D, Patel H, Daithankar V, Chauhan A, Zaveri K, Hinduja I. Dynamics associated with spontaneous differentiation of ovarian stem cells in vitro. J Ovarian Res. 2014;7:25. Bhartiya D, Singh J. FSH-FSHR3-stem cells in ovary surface epithelium: basis for adult ovarian biology, failure, aging, and cancer. Reproduction. 2015 Jan;149(1):R35-48. Bhartiya D, Sriraman K, Bhutda S, Mundekar A, Mulla S, Modak H. Neonatal exposure to estrogen affects very small ES-like stem cells (VSELs) leading to various pathologies in adults including cancer J Cancer Stem Cell Research (2013), 1:e1003. Bhartiya D, Shaikh A, Nagvenkar P, Kasiviswanathan S, Pethe P, Pawani H, Mohanty S, Rao SG, Zaveri K, Hinduja I. Very small embryonic-like stem cells with maximum regenerative potential get discarded during cord blood banking and bone marrow processing for autologous stem cell therapy. Stem Cells Dev. 2012;21(1):1-6. Abbott A. Doubt cast over tiny stem cells. Nature. 2013;499(7459):390. Nicholls H. VSELs: is ideology overtaking science? Cell Stem Cell 2013; 13:143–144. Ratajczak MZ, Zuba-Surma E, Wojakowski W, Suszynska M, Mierzejewska K, Liu R, Ratajczak J, Shin DM, Kucia M. Very small embryonic-like stem cells (VSELs) represent a real challenge in stem cell biology: recent pros and cons in the midst of a lively debate. Leukemia. 2014;28(3):473-84. Miyanishi M, Mori Y, Seita J, Chen J, Karten S, Chan C et al. Do pluripotent stem cells exist in adult mice as very small embryonic stem cells? Stem Cell Rep 2013;1: 198–208. Randall TD, Weissman IL. Characterization of a population of cells in the bone marrow that phenotypically mimics hematopoietic stem cells: resting stem cells or mystery population? Stem Cells. 1998;16(1):38-48. Kucia M, Halasa M, Wysoczynski M, Baskiewicz-Masiuk M, Moldenhawer S, Zuba-Surma E, Czajka R, Wojakowski W, Machalinski B, Ratajczak MZ. Morphological and molecular characterization of novel population of CXCR4+ SSEA-4+ Oct-4+ very small embryonic-like cells purified from human cord blood: preliminary report. Leukemia 2007;21(2):297-303. Shin DM, Zuba-Surma EK, Wu W, Ratajczak J, Wysoczynski M, Ratajczak MZ, Kucia M. Novel epigenetic mechanisms that control pluripotency and quiescence of adult bone marrow-derived Oct4(+) very small embryonic-like stem cells. Leukemia. 2009;23(11):2042-51. Mierzejewska K, Heo J, Kang JW, Kang H, Ratajczak J, Ratajczak MZ, Kucia M, Shin DM. Genome-wide analysis of murine bone marrow derived very small embryonic-like stem cells reveals that mitogenic growth factor signaling pathways play a crucial role in the quiescence and ageing of these cells. Int J Mol Med. 2013 Aug;32(2):281-90. Legro RS, Adashi EY: Introduction: germline stem cell therapy in humans: Two are not enough. Fertil Steril 2014, 101(1):1–2. Tabar V, Studer L. Pluripotent stem cells in regenerative medicine: challenges and recent progress. Nat Rev Genet. 2014;15(2):82-92. Jiang FX, Morahan G. Pancreatic stem cells remain unresolved. Stem Cells Dev. 2014; 23(23):2803-12. Irie N, Weinberger L, Tang WW, Kobayashi T, Viukov S, Manor YS, Dietmann S, Hanna JH,Surani MA. SOX17 is a critical specifier of human primordial germ cell fate. Cell 2015;160(1-2):253-68. Martin GR. Isolation of a pluripotent cell line from early mouse embryos cultured in medium conditioned by teratocarcinoma stem cells. Proc Natl Acad Sci USA. 1981;78(12):7634-8. Evans MJ, Kaufman MH. Establishment in culture of pluripotential cells from mouse embryos. Nature 1981;292(5819):154-6. Thomson JA, Itskovitz-Eldor J, Shapiro SS, Waknitz MA, Swiergiel JJ, Marshall VS, Jones JM. Embryonic stem cell lines derived from human blastocysts. Science 1998;282(5391):1145-7. Shamblott MJ, Axelman J, Wang S, Bugg EM, Littlefield JW, Donovan PJ, Blumenthal PD, Huggins GR, Gearhart JD. Derivation of pluripotent stem cells from cultured human primordial germ cells. Proc Natl Acad Sci USA. 1998;95(23):13726-31. Editorial: Advancing regenerative medicine. Nat Med. 2014; 20(8):795.